Nuuk to Ilulissat in Greenland. Start date: June 14th End of the trip: June 27th. Duration: 14 days/13 nights. Price: CAD 3,500 per person including food, drinks, bed linens, diesel costs, coffee, tea etc. Not included: alcoholic beverages, any flights to and from the start / end destination of the trip, travel insurance and cancellation, any shore excursions. Conditions: All our terms and conditions apply. Experience: Sailing experience is not necessary but a positive effort of the crew to assist sailing the vessel is expected. Intended itinerary, please note that this is a rough plan only and the schedule will be adjusted daily to cope with local weather and ice conditions. Schedules are flexible and since we sail in small company, the schedule can be changed day by day to suit personal wishes. The general itinerary remains the same, but we are flexible in anchorages, spending an extra night at sea to accommodate extra time ashore etc. Given that the weather and ice conditions permitting the new plans. Arrival onboard with a tour through the vessel and instructions and demonstrations of all the safety features onboard and what to do or not to do in case of different emergencies. In case the weather is nice and the wind is favourable, we will cross the Godthab fjord and go behind our anchor for the night, possibly with a visit ashore for a short hike. We will go anchor up as soon as we wake up and have breakfast at sea, today will be a 10 to 12 hours of sailing all the way to the entrance of the Fiske fjord. There are a few nice sheltered anchorages in this area where we can spend the night. A hike on one of the beaches along the Fiske fjord combined with a mountain hike with a view over the fjord. Continuing north, an 8 hour sail will bring us to the Inuit village Ikerasak. The next leg is a 5 hour sail to Kulinguaq, a group of 4 small islands. In the afternoon, there will be time to explore the little archipelago. A 10 hour sail will bring us to our next destination, the Qasigianguit bay. This is a very sheltered area with several near perfect anchorages and protection from weather and ice is generally not to hard to find in this area. Today is dedicated to the discovery of the land around Qasigianguit bay at the southern tip of Simiutaq island. It is a great area for hikes. There are options to walk along the water in fairly even terrain, or we could go deeper into the mountains for a great view over the area. A relative short sail to the Anders Olsen sund. After we find a save anchorage, we will go ashore for a hike of a few hours. Today we will cross the polar circle which is at 66°33N. it will be a fairly long sail of 12 hours. This is mainly because there are no anchorages on the way where we can spend the night. At the end of the day, we will try to find a place near Isortoq Island or on Isortoq bay. Today a short sail again. We will drop anchor in Qeqertarssuaq in the early afternoon followed by a hike ashore. We will go anchor up in the early morning so that we will have a few hours time to go for a hike on one of the small islands in the Amartut archipelago. The next 8 hours of sailing will bring us to Aasiaat, formerly known as Egedesminde. This is considered a large village for Greenlandic standards. 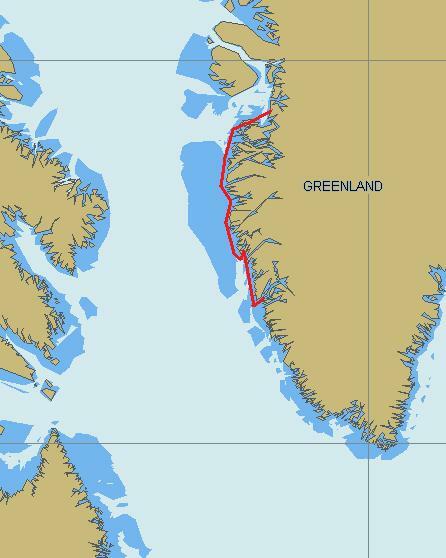 The last sail of the trip will bring us from Aasiaat to Ilulissat. On the way there, we pass by the Kangia Glacier. A massive wall of ice that drops straight in the water. Every so many hours, a new iceberg is born from the glacier front. We will approach the wall until we are several hundreds of meters away from it, not closer because glaciers are instable and dangerous. This will provide a magnificent photo opportunity. Last day onboard. There will be time to look around in the village.